Right now I'm at the mercy of friends sending in their photos. Here are a few that really struck me. Here are the Leo men. This is what I'd been thinking about the most in the weeks leading up to the wedding. We haven't had a wedding in 30 some years. 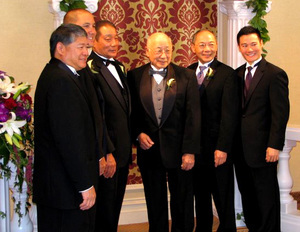 From left to right: Uncle Jon, brother Jason, my dad, Gung Gung (grandfather), my uncle Barry I call Dai Bok, and my cousin Josh. I know that this picture will make me cry in years to come. 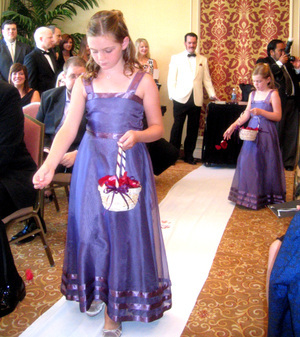 Here are my goddaughters as flower girls. They looked beautiful. Saturday morning we got dressed in my suite. A bunch of friends came to have mimosas and pastries and just hang out while the hair and makeup ladies worked their magic. Berklee & Reilly got their hair done, too. They sat in the chair SO patient while Shannon applied curl after curl. That's Jonathan in the vintage ivory dinner jacket, Shig waiting to take a photo of the bride, and Lynn smiling so bright on the left. It was great that everyone got into the Rat Pack theme, all the dress up clothes really added to the atmosphere. 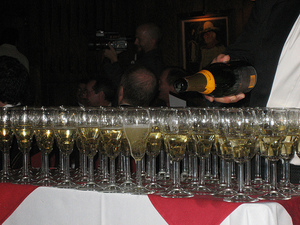 Mary Ladd got a nice shot of the champagne. I barely drank at the reception. Just this glass and a half a cosmo. John thinks he had some drinks at the reception, but he really can't remember and he's busy relaxing right now. Now he's thinking about it. He didn't drink until we got to the Rush bar at Golden Nugget afterwards. The room was perfect. Matt Lyons passed out our gifts before we got there which were our personal 777 playing cards. The main room of the Golden Steer is already so vintage we didn't need to decorate much. All we did was add a few framed old Vegas photos, vintage record albums, and I think there were assorted old swizzle sticks and Vegas matchbooks from hotels and casinos that have long since been imploded. Mark Levine, our emcee, was the best. Some people are just born hosts. He made the last minute change of plans to have everyone seated for our entrance. That was a great call. I can't describe the feeling of walking in and seeing all your friends and family looking up at you, smiling and clapping for you. I didn't know what to do. I think I waved. But that moment lasted and lasted. It was truly something special. 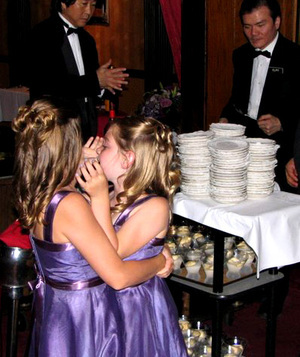 Berklee & Reilly were SOOOO excited about the Bananas Foster. So were a lot of other people! We got lots and lots of compliments throughout the weekend, but one of my favorites was when a few people later told us how much they wanted to return to the Golden Steer for a full meal. It made me really happy that we could introduce this great Vegas legend to others who would've never thought of eating in a little strip mall a block off the Strip. Please send in more photos so I can keep recounting the events of the weekend.